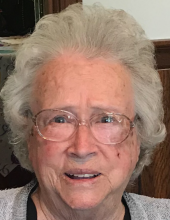 Helen Hubbard, 85, widow of Earl, passed away Wednesday, March 20, 2019 in Georgetown, Kentucky. Helen was born in Manchester, Kentucky on July 13, 1933 to the late William and Florence Brock Cottongim. She was a loving mother and served God faithfully at New Home Baptist Church in Manchester, Kentucky and at Safe Harbor Baptist in Georgetown. Helen is survived by her 7 children, Wilma (Ron) Foster of Lexington, Sue Padgett of Georgetown, Pete Hubbard of Nicholasville, Carl (Brenda) Hubbard of Georgetown, Ronnie Joe (Rhonda) Hubbard of Georgetown, Rickey (Melissa) Hubbard of Somerset, and Jim Hubbard of Georgetown; 18 grandchildren, 38 great grandchildren, and 11 great great grandchildren. She is also survived by 1 brother, Bill (Sue) Cottongim of Lebanon, Kentucky, and 3 sisters, LouEllen Lawson of Lexington, Della (Sonnie) Foster of Lawrenceburg, and Alma (Farley) Sproles of Lexington. Helen was preceded in death by her parents, and loving husband of 62 years, Earl Hubbard, son, Earl Hubbard, Jr., son-in-law, Ronnie Padgett, and great grandson, Andrew Scott Hubbard. Visitation for Helen will be Friday, March 22, 2019 from 5:00-8:00 pm at Tucker, Yocum, & Wilson Funeral Home. Funeral services will be held at 2:00pm, Saturday, March 23, 2019 at the funeral home with Pastor Andy Waldroup and Pastor Eli Broughton officiating. Burial will follow in Georgetown Cemetery. Serving as pallbearers will be Grandsons: Ronnie Foster, Anthony Hubbard, Jonathan Hubbard, Bryan Hubbard, Ronnie Lee Hubbard, and Brandon Hubbard. In lieu of flowers the family is requesting donations to: Safe Harbor Baptist, 519 Gano Ave., Georgetown, Kentucky 40324 or Bluegrass Hospice Care, 1317 US HWY 62E, Cynthiana, Kentucky 41031. To send flowers or a remembrance gift to the family of Helen Hubbard, please visit our Tribute Store. "Email Address" would like to share the life celebration of Helen Hubbard. Click on the "link" to go to share a favorite memory or leave a condolence message for the family.